There is also the Xsheet View menu button in the top-left corner, which allows you to access commands related to the Xsheet view. The Xsheet view lets you read the timing vertically, displays the drawing layers as columns, and shows the drawing’s name. You can also see the functions and keyframes of the motion paths in the Xsheet’s function columns. 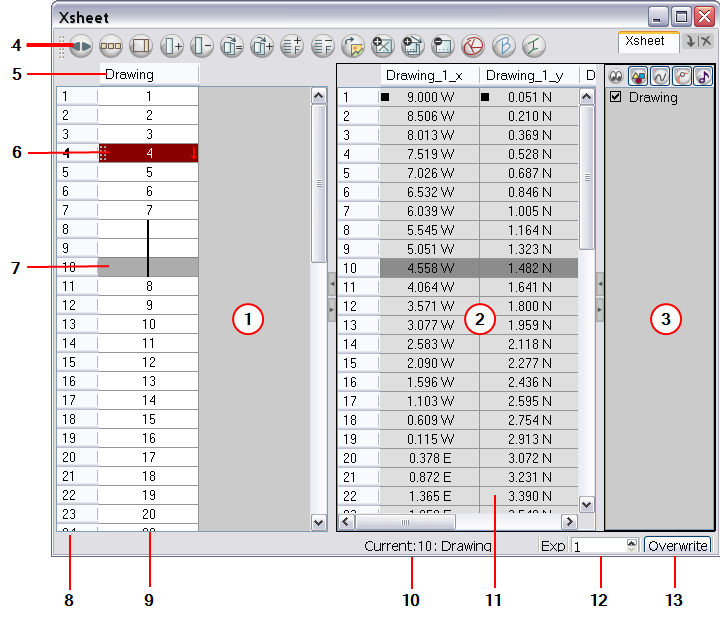 The value of each keyframe is shown in the Xsheet view; these are displayed as black squares in the Timeline view. The Xsheet view contains more details than the Timeline view, and is faster and easier to read.